Report and images by International roving correspondent, Billy R. Mollymook, Australia. 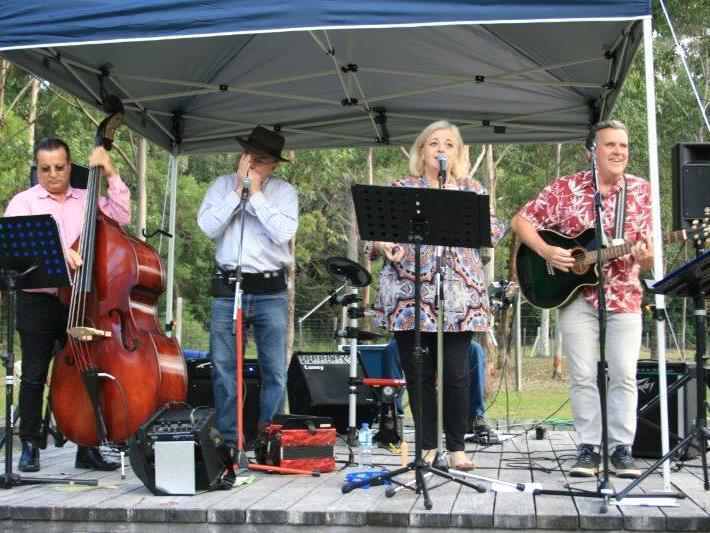 A very pleasant afternoon was anticipated by the Mollymook Ocean Beach swimmers heading off to the Bawley Point Winery to be entertained by none other than our very own man Michael Gaffney, a man of many hats starring in the band called The BLUE MOON CAFE all the way from Canberra. They were all nervous Nellie’s at first, worried that the Canberra Feds gave them a clear warning arrests would be made if they played anywhere less than a few hours drive from Canberra. Especially after the debacle caused when many screaming fans of all genders were throwing an assortment of underwear etc onto the stage. There was pandemonium as Mike stood there with guitar in hand looking like a mannequin on display in an adults only shop. After two hours of non stop collectic I don’t know music the Bawley Winery security, namely a band of patrolling geese called it a day and went into attack mode squawking “Enough Enough”. Seriously though, it was a great afternoon of excellent musical entertainment. 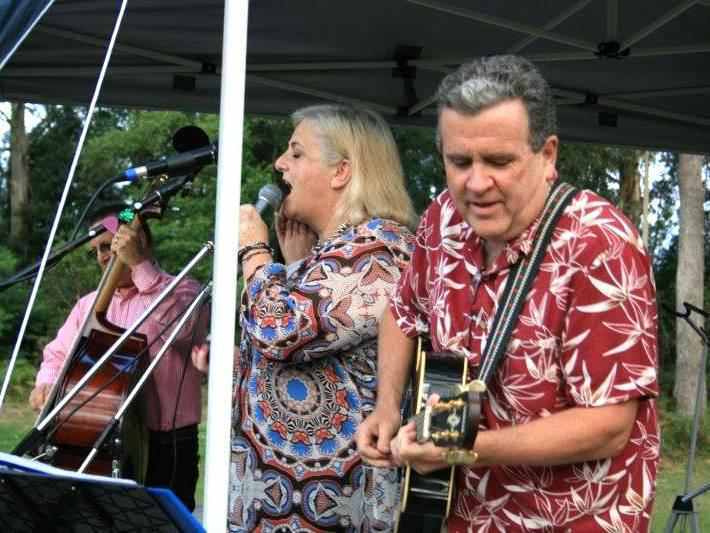 Many thanks to Michael and the band for putting on such a fantastic performance. “DEFINITELY” a must to see. 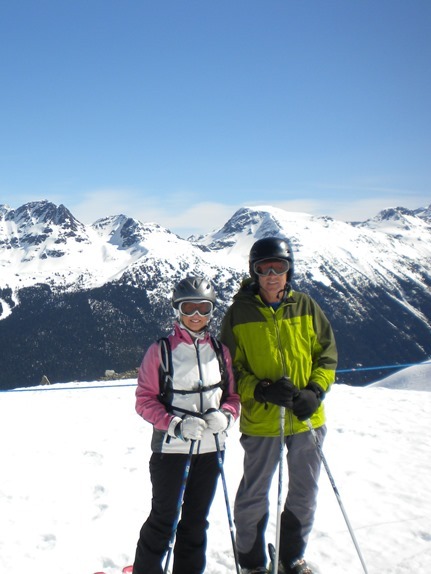 Chris W. and his aquatic wife Sue had this pic taken on ‘Whistler mountain’ looking towards the 7th Heaven on Blackcomb mountain, British Columbia, Canada. Chris writes: “We are skiing every day followed by a spa in the “hot tub” and meeting people from all points of the planet. What a great holiday and I think Sue is forgetting how to swim after 2 weeks of skiing”. 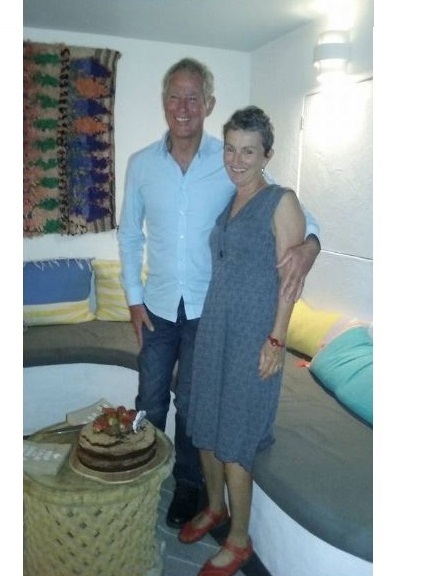 ‘Lady of the moment’ Kath celebrates her ‘Big O’ with husband Steve and a large group of Mollymook Ocean Swimmers at the Bannisters Pool Bar. 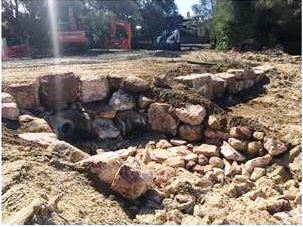 Works at Mollymook Beach and Blackwater creek are currently underway with the rock protection structure now complete. As this is a buried structure, the majority of the rock is not visible on site, however you will notice some rock protection at the existing storm water and overflow outlets at the top of the bank and shown in the photo. The carting of sand from Lake Conjola to Mollymook is scheduled to start on Monday May 2, 2016 and continue over a 2 week period. Works are scheduled for completion in June 2016. 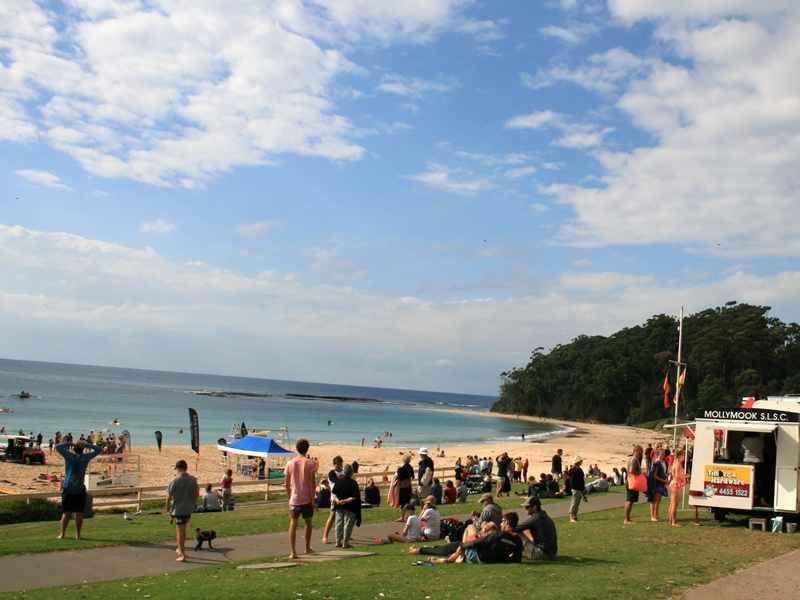 This update was provided by Matthew Apolo, Shoalhaven Council via John Holt CEO Mollymook Golf Club. 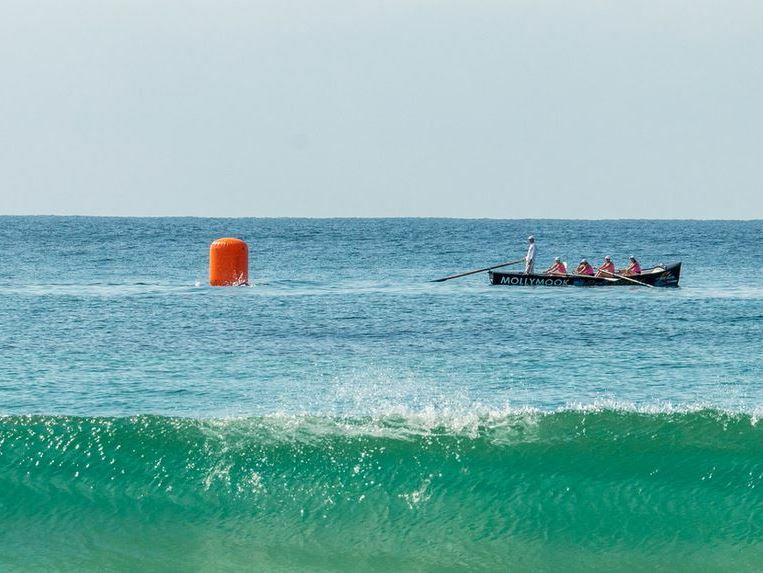 Race report and photography, courtesy of Billy R.
A perfect day for ocean swimming: Sunday treated the 2016 Mollymook swim to a picture perfect Autumn morning. We were greeted to a beautiful crystal clear, sparkling ocean panorama basking away in the glorious morning sunshine . ‘How fortunate we are indeed’.